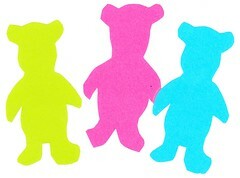 Paste a variety of different sized teddy bear shapes onto a sheet of paper. Paste a teddy bear onto a rectangle of coloured paper or card. Glue a piece of material over the teddy to put him/her to bed, under a sheet or blanket or in a sleeping bag.